The crusader armies crossed over into Asia Minor throughout the first half of 1097, and were joined by Peter the Hermit and the remainder of his little army. Alexios also sent two of his own generals, Manuel Boutoumides and Taticius, to assist the crusaders. Their first objective was Nicaea, an old Byzantine city, but now the capital of the Seljuk Sultanate of Rüm under Kilij Arslan I. Arslan was campaigning against the Danishmends in central Anatolia having left behind his treasury and his family, and having underestimated the strength of these new crusaders. The city was subjected to a lengthy siege, and when Arslan heard of it, he rushed back to Nicaea and attacked the crusader army on 16 May. He was driven back by the unexpectedly large crusader force, with heavy losses being suffered on both sides. The siege continued but the crusaders had little success, as they could not blockade the lake on which the city was situated, and from which it could be provisioned. Alexios therefore sent them ships, rolled over land on logs, and at the sight of them the Turkish garrison surrendered on June 18. The city was handed over to the Byzantine troops, which has often been depicted as a source of conflict between the Empire and the crusaders; Byzantine standards flew from the walls, and the crusaders were forbidden from looting the city or even entering it except in small escorted bands. However, this was in keeping with the oaths made to Alexios, and the emperor ensured that the crusaders were well-paid for their support. As Thomas Asbridge says. "the fall of Nicaea was a product of the successful policy of close co-operation between the crusaders and Byzantium." The crusaders now began the journey to Jerusalem. Stephen of Blois, in a letter to his wife Adela, wrote that he believed it would take five weeks. In fact, the journey would take two years. 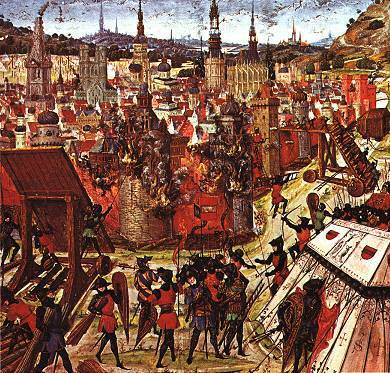 The Siege of Nicaea took place from May 14 to June 19, 1097, during the First Crusade. Nicaea, located on the eastern shore of Lake Ascanius, had been captured from the Byzantine Empire by the Seljuk Turks in 1077, and formed the capital of the Sultanate of Rüm. In 1096, the People's Crusade, the first stage of the First Crusade, had plundered the land surrounding the city, before being destroyed by the Turks. As a result, Sultan Kilij Arslan I initially felt that the second wave of crusaders were not a threat. He left his family and his treasury behind in Nicaea and went east to fight the Danishmends for control of the Melitene.